When I saw this darling little Art Impressions stamp set (In the Air) at CHA, I wanted to color it asap! 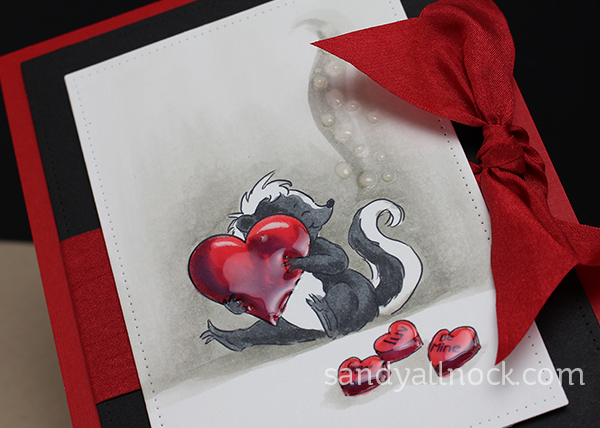 So cute to have sweet little skunks representing some of the relationships we have in life, isn’t it? 🙂 The subtitle for this video is “It’s a hot mess…until it’s not!” which is pretty much also a good relationship descriptor, right!? Just keep working on your relationships, be committed to them – and they’ll come around. Just like coloring! Watch the video below to see what I mean about the coloring side…you can also click HERE to see it directly on YouTube. With each card, I made a similar design – and *gasp* I made four of each! I’m getting things together to do a fundraiser for a ministry at church, since valentines seem to be something people will drop more than a buck or two on. Especially the guys, and the women buying for their kids and grandkids! I used my Avery Elle Pierced Rectangles to add a little interest to both the white and black panels. And the pretty red ribbon is by May Arts – there’s only a little of this left in stock HERE – if you want a few yards, snag it quick! And I’m extra excited to tell you that this stamp set is the first (of many more to come) from Art Impressions that’s available at Ellen Hutson! More are coming, so hang onto your hats. Those great stamps AI makes will be able to be purchased on the same order as all your other crafty needs – I for one love combining my shipping costs and get everything I need in one place. Yay! I love your cards!! !got to get this stamp ! !thanks for the tutorials,I learn so much from them Thanks and God Bless. Too stinking cute. Love them all. This set is on my wishlist. So Cute, Sandy! That is one thing I love about Copics, you just keep going and they blend! Thanks, for all of your encouragement. I think it’s important to encourage each other. Sometimes the difference in successful coloring and not successful coloring is just the courage to keep going or to play (meaning not worrying about it) and see what happens. I’m a Pepe Le Pew fan and when I saw you colouring this set I thought, GOTTA HAVE IT! Love what you did with it. Love the ‘pong’. Cracks me up. 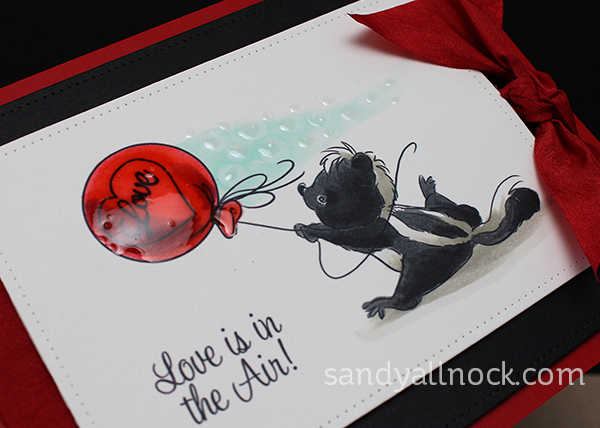 Sandy, you have to be one of my favorites and the little skunks are just so stinkin’ adorable! I wanted to put everything in my cart to make these cards but EH was out of almost all of the markers that I needed. Where there is a will, there is a way – right? However, you didn’t list the color of blue you used for the “ground” beneath the skunks. Would appreciate knowing. Thanks so much for sharing your beautiful talent with us. Oh sorry—I think it was BG10 or BG11. 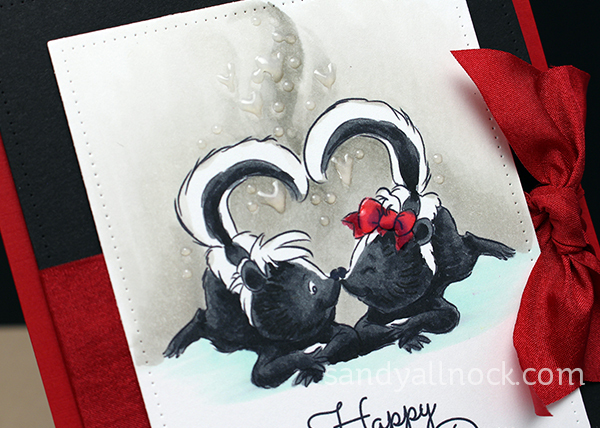 So stinkin’ cute (haha)…Love the skunks! Sandy, I smiled when I saw your cards. I have to say that they stink. ..with sweetness! I also have to say that I admire your colouring techniques -you take a simple image and make it come to life. Amazing!!! 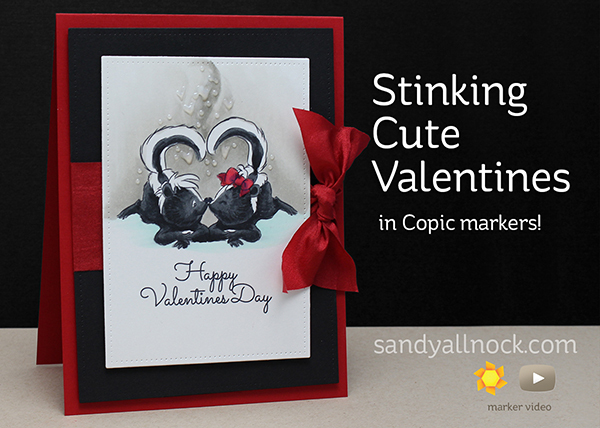 So right – stinking cute! As usual your coloring is beautiful. The beautiful ribbon and the glossy accents finish it beautifully. What an adorable card Sandy! (Or I should say, cards!) Fantastic work. I LOVE the real time videos as I am just learning to use Copics and I need the tutorials! Pinned it for reference so Thank You for that! I only have about 30 Copics but hope one day to have enough to get the Hex chart for reference as well! 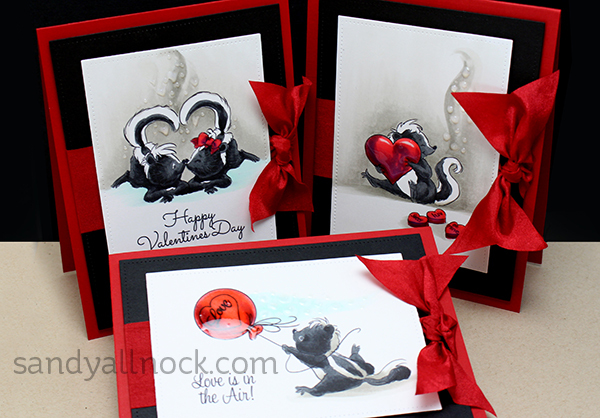 Totally impressed how you colored the black skunks with copics. Last time I tried to color a black cat it was a hot mess! Off to watch your video now to pick up some tips. Oh my word! Indeed STINKING cute and I love how you colored them. These cards are so stinking cute! Pun intended! Love your coloring on these! I am riveted to your videos as you take a stamp image and turn it into art….magical. Your ‘Stinky Couple’ are so dang cute; no words to describe the transformation. Stunning! Cute stamp set as well as your cards. I like how you showed us how to color the skunk and create a complete background. That ribbon–yummy! Thanks for the really cute cards that brought a smile to my face!